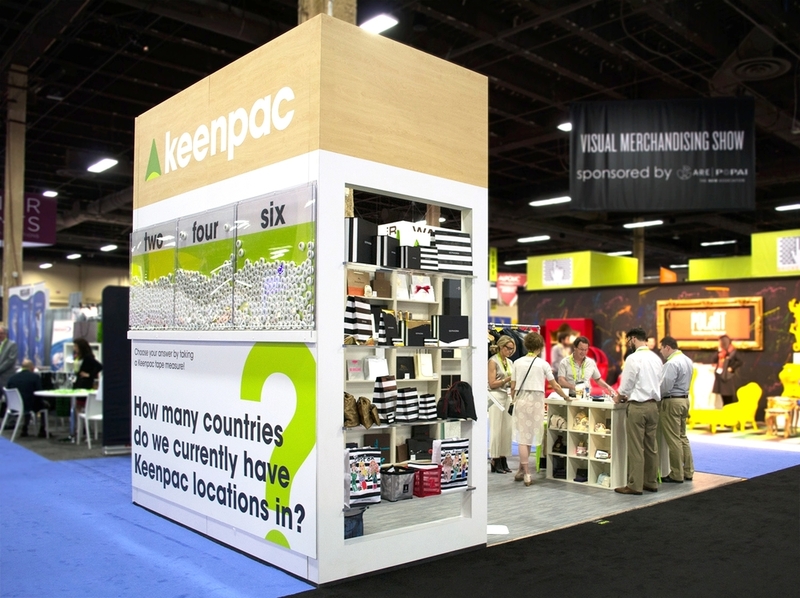 Keenpac are retail and product packaging specialists who participate every year at GlobalShop. 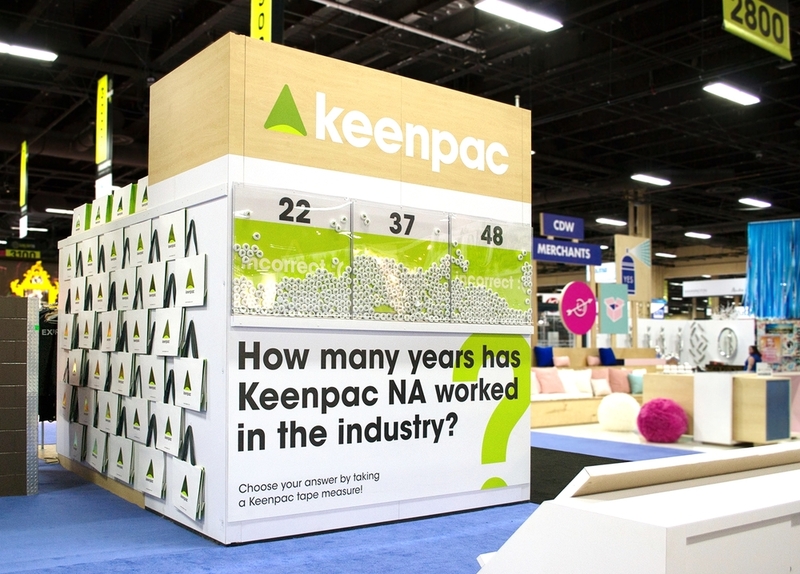 With a 10’x20’ space Keenpac needed an attractive and inviting booth for GlobalShop 2016. Building on the learnings from last year’s booth I explored different ways to communicate Keenpac’s core business and services without overwhelming the clients with information. I developed a holistic concept focusing on educating the customers about the company’s process and core capabilities in a visual and playful way that encouraged a social gathering and client interactions. Collaborating with a graphic designer we created a wall graphic illustrating the journey of a package. We simplified the process into four essential steps with vivid iconography using the color palette from Keenpac’s logo. 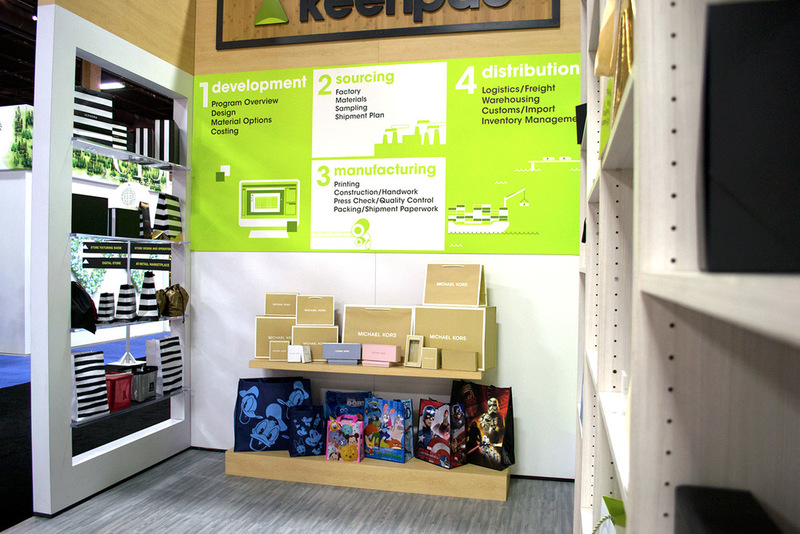 Continuing with the same look and feel we also created another wall graphic summarizing Keenpac’s product assortment. Both illustrations aimed to show Keenpac’s aptitude in communicating their fundamental services and efficient operations. An interactive multiple-choice questionnaire was installed on the exterior wall with a new question changing every day enticing the visitor to want to know more about Keenpac. The visitor had three answers to choose from by picking a free Keenpac tape measure from the dispenser. At the end of the day we were able to collect data from the remaining tapes measures. The result gave us good insights about how many people visited the booth and also from a customer perspective informed them about the company business. The game was engaging, informative and led to many conversations between the sales team and prospective clients. I also utilized the back wall by hanging hundreds of Keenpac bags creating a display that enhanced the brand in functional way. Customers were able to take a free bag to keep all their collected marketing materials. 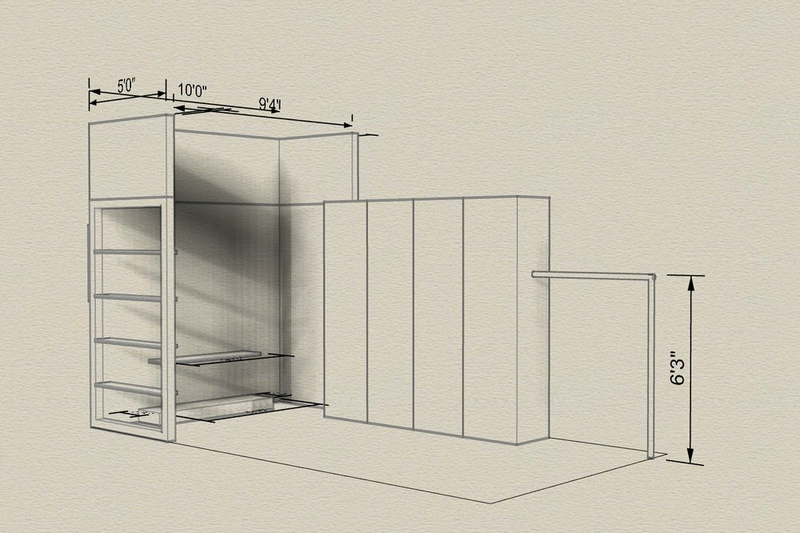 The booth was also designed in mind to help encourage conversations and interactions between the sales team and visitors. The two main outer walls drew visitors in and also helped define the space while guiding them once they were in the booth creating a nice flow. I placed a multifunctional table at the edge of the booth to help enhance the open space feeling. The table not only served as a display but also allowed for the sales team to continue any conversations they were having with visitors in more depth. By designing innovative solutions we solved complex problems such as having to reuse components from last year’s booth, displaying a large quantity of products with very limited space and creating a strong interest among the visitors. With a team of four people we installed the booth the day prior to the opening of the show.